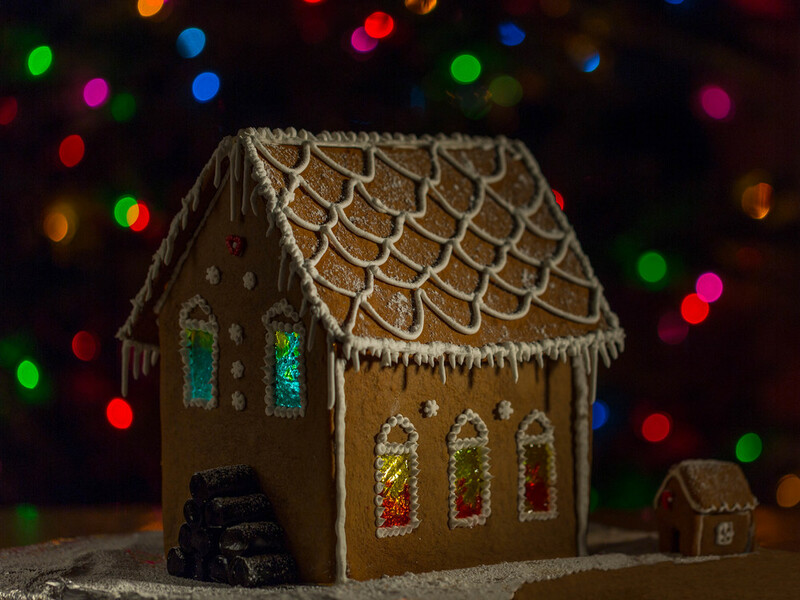 Nothing says Christmas like a homemade gingerbread house. Melt butter, syrup/molasses and brown sugar in a saucepan over medium heat. Remove from heat, and stir in baking soda and spices. Let the syrup cool down for a bit, before you add egg and flour. Add syrup to a stand mixer, and mix in the egg and flour and keep mixing until you have a smooth and shiny dough. Let the dough rest in a ziplock bag in the refrigerator for at least 4 hours, before rolling out. Preheat the oven to 355 ℉ (180℃). Roll out the dough on a floured surface. The dough needs to be about 0.1-0.2-inch (3-5 mm) thick. Cut out the small and large house and place them on a parchment lined baking sheet. If you want other shapes than gingerbread houses, use cookie cutters to cut them out. Bake the cookies for about 5 minutes for cookies, and 10-12 minutes for the larger pieces for the houses. For houses with candy windows. Bake the house-parts for 5-7 minutes, remove from the oven and fill the windows with crushed Jolly Ranchers hard candy. Bake the house for another 5 minutes until it's baked and the candy is melted and filled out the window frame. Glue the house together with royal icing or hot melted sugar. And go crazy with the decorating. For cookies - decorate your heart out with color and sprinkles. Skabelon til et stort peberkagehus. Opskriften er fra: Familie Journal. Smelt smør, sirup og farin i en tykbundet gryde. Når det er smeltet, tag gryden af varmen, rør natron og krydderier i. Lad massen køle lidt af og kom den i en stor røreskål. Tilsæt æg og mel, og bland dejen indtil den er glat. Lad dejen hvile tildækket i køleskabet, i mindst 4 timer inden den rulles ud. Rul dejen ud til den er ca. 4-5 mm tyk. Skær både de små og store huse ud. Dejen bages ved 180°C fra 5 minutter til 10-12 minutter - alt afhængig af om det er små kager eller større flader til peberkagehuse. For huse med "glasvinduer" bages husdelen først 5-6 minutte, tag dem ud af ovnen og fyld vinduesrammen ud med knust bolche. Bag husdelen videre i 5 minutter, indtil bolchet er smeltet ud i vinduesrammen og kagen er gennembagt. Lim huset sammen med royal icing og dekorer som du lyster. Kager dekoreres med glasur og sprinkles.